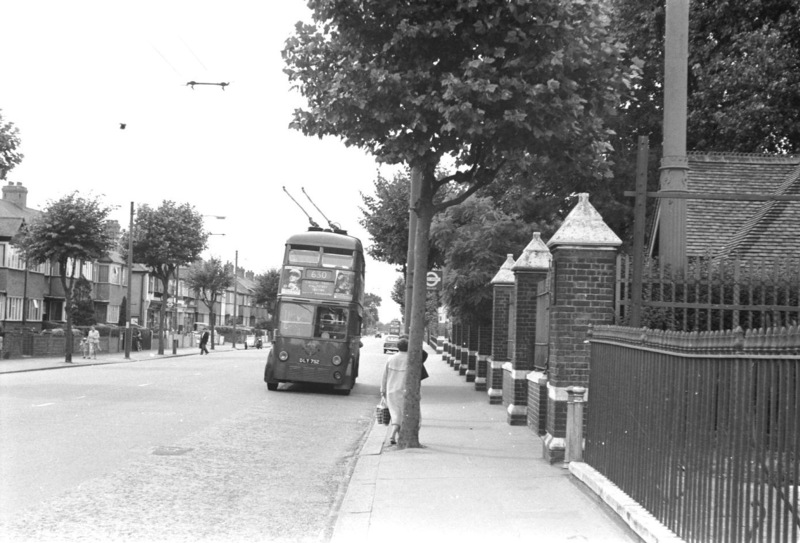 Picture 557 shows the Mitcham Road Cemetery stop during the last week of trolleybus operation in July 1960. From here you could be whisked into Croydon in a little over ten minutes, having waited only a few minutes for your bus to come along [look carefully in the picture and you will see the next trolleybus in the distance!]. This was the dawn before widespread private car ownership which has since transformed this stretch of road into an almost gridlocked traffic situation for most of the day. The houses and the small cluster of shops remain but now have a continuous row of park vehicles in front of them. Long gone is just seeing a few cars and a couple buses from this spot and your journey time, either by bus or car, into Croydon has dramatically increased. 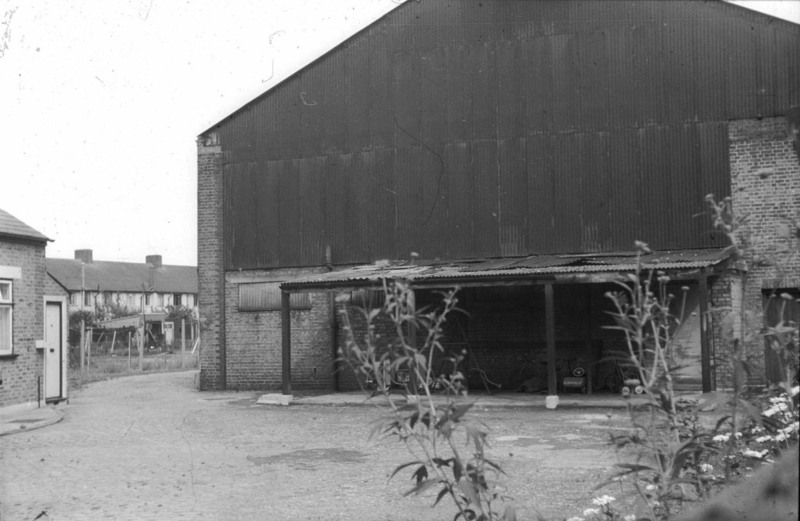 Aurelia Road, off Mitcham Road, is just behind the photographer and was home to SMET's Mitcham Road Depot between 1906 and 1936. In 1959, this former tram depot still had a trace it's former life by the road scars of the tramway track. For picture 421, the camera was held up over the high gates but sadly there was very little to associate the building with its past, but a picture taken 40 years earlier may have caught as many as 15 electric trams on the site. Picture 420 was originally taken just to show the entrance to the former tram depot but subsequently the picture is of equal interest for the vehicles parked in that road one Saturday afternoon in 1959. No problem parking then, but today there never seems to be a space available.! In your commentary about Aurelia Road tram depot [alias Mitcham or Mitcham Road] - I too was bunked up on to the gates to see where the tracks had been in the late 1940's - it ceased to be operational in 1926, the SMET cars going to store at Fulwell in exchange for U type cars loaned by LUT and worked from Sutton. 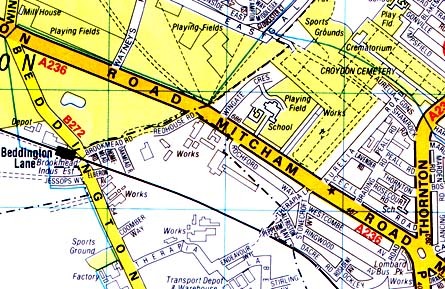 LPTB removed the connecting facing point track layout in the Mitcham Road in December, 1935. 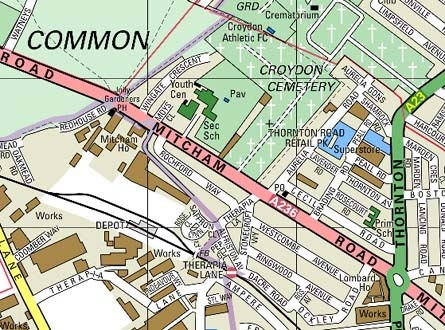 However, the need to remove George Cohen's scrapping operations from Brixton Hill so Telford Avenue could be reconstructed within to accommodate the Feltham cars, saw a trailing point connection re-established in June, 1936. Renamed Croydon depot so as not to confuse its location with Mitcham for Hanwell and Wandsworth drivers as well as the scrap men [from Hammersmith! ], it was reopened in the autumn as a scrap yard. It remained thus until November, 1937, when LPTB refused Cohen's request to repair the leaking roof. Instead, Purley depot which had closed that September, was reopened as the replacement scrap yard. I do have photos of Aurelia Road when also used to store the tower wagons for the rewiring for trolleybuses. I came across your site after visiting another about the new Croydon tramways. I guess you and I am in the same age bracket and as such used public transport a lot when you were young. I used to live in Worcester Park and worked for a few years at Expanded Rubber & Plastics in Mitcham Road. Route 630 passed the door. It had been a tram depot for Croydon trams, probably before the war, and had a narrow entrance opening out onto a big shed. It had grown a lot since then since the Company had manufactured the rubber material used for aircraft seld sealing fuel tanks but the original shed and attendant buildings were easily spotted. I travelled to work on the single track rail line from Wimbledon getting off at Beddington Lane. I think they were 2 car set diesel electrics, the only ones I knew of on the Southern. That was in the late 50's, early sixties. I was very interested to see what had become of this railway and turning into a tramway just couldn't be a better outcome! All those pictures of Kingston, Tolworth, Hampton Court, Shannon Corner, Mitcham common are very evocative for me including that odd route 654 from Sutton to Crystal Palace, passing Croydon Airport (another of my favourite venues). I seem to recall the six wheelers they used on this route were shorter than normal and were fitted with special gear to stop them running backwards down Anerley Hill at any speed. Is that how you spell Anerley or is it Anerleigh? It was all a long time ago now! You were taking colour when we mostly had black and white pictures, the surrounding detail, especially the cars ........... I am going to have to look very carefully, I might be in one of them! I used to love going from New Malden to Hampton Court, especially upstairs and especially on the last stretch where the overhead ran between the two parks. Sometimes the trolley bus would get up a fair old speed. Well it seemed like a fair old speed! When I was younger we lived in Battersea for a while and I used to go to school on a tram, number 12 I think. A wonderful Aunt of mine took me on the 31 which went from Battersea up to town and through the Kingsway Subway. Another time I was taken somewhere where they changed from the conduit collection to overhead. I thought that was incredible, that plough coming out from underneath! I have never been able to remember where it was. Later on I lived near Reading and went to school on the Corporation trolleybuses. I am so glad I lived all that, modern day kids only know cars, how sad. I am afraid that information on the Aurelia Road tram depot is rather sparse. The OS 6-inch map of 1955 marks the premises as "Corporation Yard". The current OS map shows the outline of the building but does not give it a name. Neither the last of the series of pre-war Croydon street directories  nor the only post-war one  mention the premises at all. Apparently for a time during the war it was used as a temporary mortuary for bomb victims. By 1995 it housed a window and double glazing firm called Astral but they left some years ago and it may well have been empty since then. I can find no information on when between 1955 and 1995 Croydon Council relinquished it, nor whether other firms were in there before Astral. A quick inspection of the site this lunchtime [25 June 2003] revealed that, although most of the old depot building has now been demolished, its southern wall is still standing and has apparently been left to form a boundary wall for the adjacent site upon which the Wandle Housing Association is currently having an estate of 15 houses built. Although I now live in Milton Keynes, I lived in Mitcham as a child, and I distinctly remember the 630 as my father worked in Croydon, coincidentally in Aurelia Road at the 'Powers' accounting machine works [later ICT then ICL who closed it]. I recall the tram depot opened onto the main road [was that Mitcham Road? ], and that it was a car repair garage in my day although the rails were still clearly visible inside, for the full length of the shed. 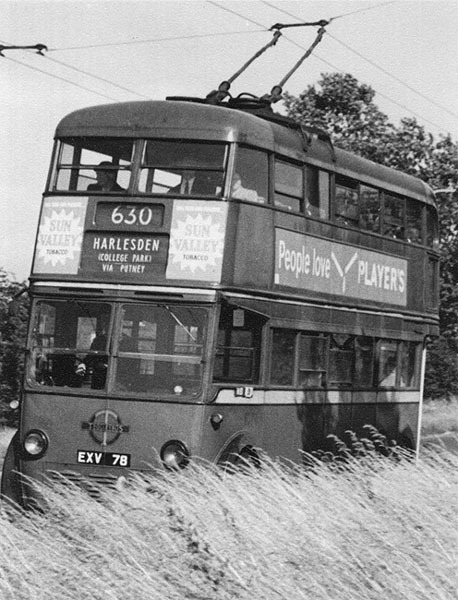 I have searched the house and have found a small black and white picture of EXV78 crossing a very wild looking Mitcham Common on route 630. Saw your Trolleybus web site and was interested to see a picture  of Aurelia Road in 1959. I was born in 1950 and lived at 61 Aurelia Road until I was 21. I can remember using the Trolleybus to go to Croydon on Saturday mornings, cost about 1½ old pence I think. The overhead connectors fell off fairly often I seem to remember. I am documenting my family history and would be grateful if I could include your Aurelia Road photo [with acknowledgement of course]. [Not a problem - David Bradley]. It is a pity you have not posted any pictures of trolleybus 445, which had a seat beside the driver right to the end of its days on LT - contrary to references to it in books. I lived in Mitcham Road Croydon from birth in 1933 until I got married in April 1959 and the seat by the driver was still in place from the start in 1937 until that time. I always hoped that particular trolleybus would come along when I was waiting at the stop. If it did, I used to make straight for the said seat. I do not recall any other trolleybuses that had this seat. Just a note if of any interest, the Depot was a Plumb Center [large plumbers merchants] before being taken over by Astral Windows. This would be around 1981 - 84, when my Dad, who I assume is the anonymous chap at CSK, first set up working next door. I lived in Rochford Way, which backed onto the Rubber Company, until I was 14 [1943 until 1957]. The area behind the house started as a wilderness but was turned into their playing fields with a very large fence. I had no idea that their factory was the original tram depot although I walked passed it very frequently to play football on Mitcham Common. Too young to notice the tram tracks I suspect. Even more surprising was the picture of the Tram depot in Aurelia Road, never noticed that at all. The picture shows the bus stop by the Cemetery. I used to walk from Rochford Way through the Alley Way past the shops [shown on the left of the picture] across the main road, never very busy, and catch a trolley bus at this stop. Took the 630 to West Croydon and then changed onto a 654 to its terminus on Crystal Palace Hill and then changed to a diesel to go onto school in Dulwich. All those memories recaptured in a few photos on your website. Reeves Corner, the hairdresser next to the bus stop at West Croydon etc etc. I am pretty sure that the two coach trains that used to run to Beddington Halt were electric and not diesels, interesting that they are now part of the Croydon Tramway. Also interesting that Aurelia Road stopped prior to a Railway footbridge I didn't know that the same road name continued on the other side of the railway. I suppose its possible that they even link up nowadays. I also remember the seat alongside the driver mentioned by another one of your contributors I always imagined that there were more than one bus in this configuration but as I rode it nearly every day for 3 years perhaps I was just lucky. Last time I went back to Croydon I got completely lost in the centre but must try again as I think that the Mitcham Road area has not changed that much. Great website, loved your spoof but could Croydon have both trams and trolley buses? I found your sight today after talking to a friend who remembers the trams in Aurelia Road. I find it interesting that trams have once again come to Croydon although at Therapia lane. 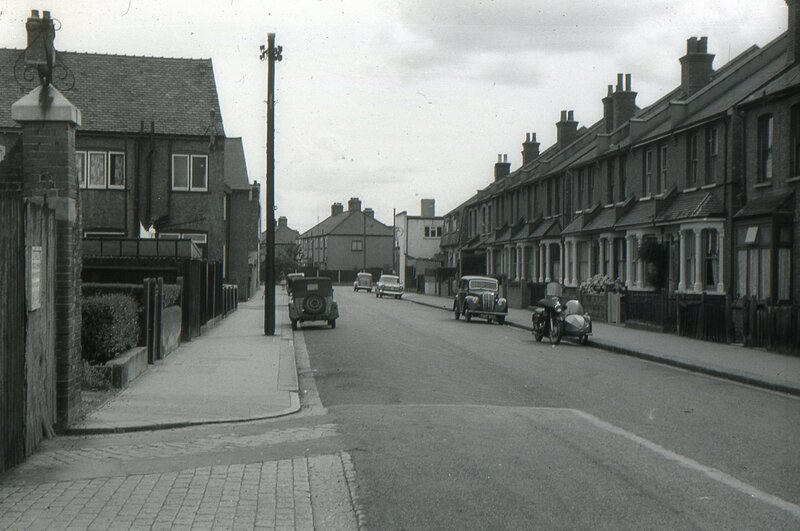 Picture No 420 shows Aurelia Road and my house [I live at no 19 which is near the motor bike] and I would like to have a copy showing my road practically empty of cars and how it used to look, thank you. Great site David. I was sitting here in New Zealand playing with Google Earth and trying to locate Expanded Rubber and Plastics where I used to work [1964-8]. Typed the name into Google and up came your site. Great nostalgic pics. I was born in Thornton Heath  and well remember the trolleybuses though I was too young to photograph them. All the best. I lived in Aurelia Road for 24 years of my life, my mum and dad 40 years. My dad is now 97 [but still drives] and I am 60. Would just like to say I remember the trolleybuses well and the old tram depot in Mitcham Road just around the corner from Aurelia Road.